It’s been only a month from our version 1.1 release and the responses we received about image link and caption features had been extremely positive. 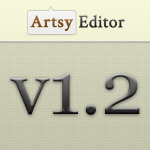 Today, we are releasing version 1.2 which contains one very useful feature that solves a time-consuming problem. It is the edit shortcut feature. Type in the URL of admin dashboard => Click Pages => Click Edit on that particular post. 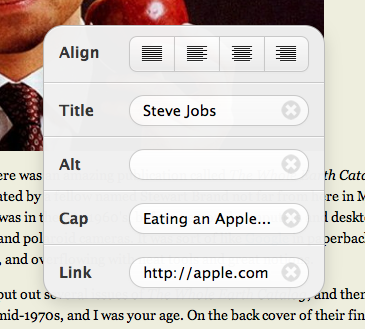 Type in the URL of that particular post page => Click Edit Post at the bottom of the page. Depending on how fast your blog is, it will take anywhere from 6 to 15 seconds to complete the process (not including editing, just opening the edit page) from start to finish, except if you can remember the direct editing screen URL which contains an arbitrary number. It is very simple. 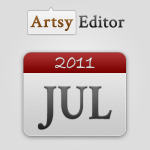 If you add ?edit at the end of any post/page URL, Artsy Editor will redirect you to the corresponding editing screen right away. This is powerful because now you can access the editing screen faster than ever before. For example, you don’t have to click through the cluttered WordPress admin panel three times nor need to remember the arbitrary number to access the editing screen. 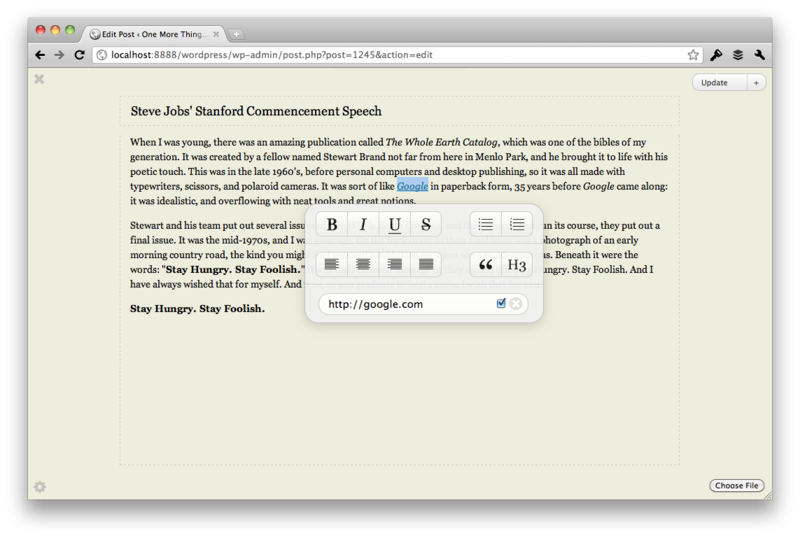 Just append ?edit and you should be able to start working on your post in 1-2 second. Hope you are enjoying this feature we highlighted! For more information about this version or past versions, visit our changelog. 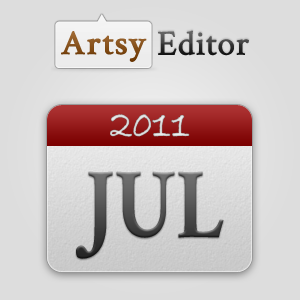 It’s been an awesome month since Artsy Editor launched back in July 27, and I want to share with you all the important events that had happened in the past 30(+) days with Artsy Editor. We reached profitability even before launch. Our official launch on July 27 had gotten a lot of attention including the folks at The Next Web. We continued to receive press coverage from sites like WPMU.org and TechInch.com. 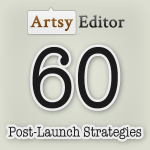 We had a case study with WooThemes about our process building artsyeditor.com using their WooFramework. 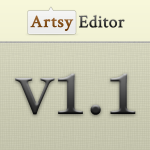 Someone in the Google+ team bought an Artsy Editor developer license. We started accepting credit cards for payment as well. We had a little 20% promotion sales on July 4th. 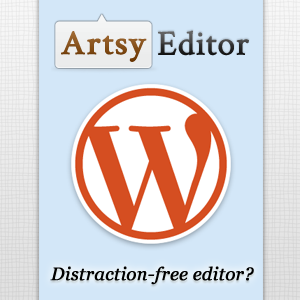 WordPress released 3.2 that included a distraction editor, here is our response to WordPress. We released version 1.1 that added many image-related features. 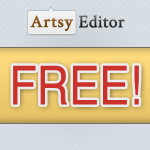 We began a campaign which you can get Artsy Editor for free if you blog about us. Our founder got featured on IdeaMensch. We organized a 90% off developer license deal with Startups.com. 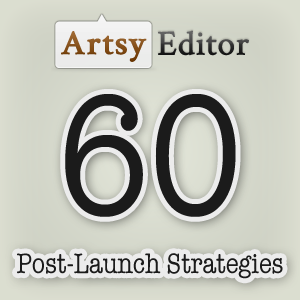 We talked about 60 post-launch strategies for startups. Let’s see what August has to offer. We will have a post just like this at the end of August. Subscribe to keep in touch! Many startups have the Post-Launch Syndrome, where they had a successful launch but couldn’t keep their momentum to a continuous success. Launch is only a small part of the journey. It doesn’t necessarily make or break a startup. What’s important is if you can take your startup to a success after the initial buzz had died down. 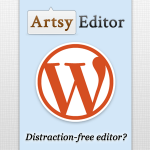 I am working very hard on exactly that with Artsy Editor, a really awesome WordPress WYSIWYG editor. And I want to share with you 60 strategies you can use in order to increase brand awareness and boost up sales after your startup launch. Promote your product through education. 37Signals and Mint are great examples. Send personalized promotion to previous customers. Amazon executed it fantastically. Put up a promotion sales on memorable days (holidays, birthdays, etc.). Give out discounts/giveaways to news coverage about your product. Do cross promotions with related, non-competing products. 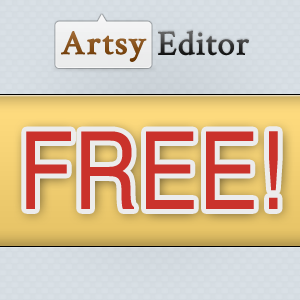 Give free copies to those who blog about your product. Put up a fun contest where potential buyers can participate to win. Blog about tips and tricks that will help your customers use the product better. Offer freebies regularly to customers to keep them excited. Be a part of Top 10 list. #1 will be the best. Do case studies with customers about how your product had helped them. Email all customers once/twice per year and ask them for feedback you can act on. Put up a survey to your customers before adding a feature. Ask your customers what is the one feature that helps them the most. Even send them a thank-you card if you have their mailing addresses. Give away your product for free in exchange of advertisements. Advertise differently on every possible feature. Don’t be boring, use creative advertising. Advertise on exclusive one-ad site using The Deck or Fusion Ads. Use advertisement as a form of testing your market. Join communities where your customers hang out and build a strong reputation. Only be present at networks that your customers are. If none use Facebook, ignore it. Post up teasers on sites like Forrst & Dribbble. Actively participate in relevant conversation about your product. Use Twitter search to find people that is looking for the solution you provide. Do “shameless plug” of your product only at relevant places. Try to get the most respected people of your customers to use & love your product. Focus on a small niche and get as many customers there as possible before moving on. Collect email leads from people who aren’t ready to buy yet, and followup regularly. Be as personal as you can answering support emails. If you mess up something, be brutally transparent and honest about it. Offer a refund/discount when you mess up. Try to answer emails as soon as they arrive. Live-chat with visitors using tools like Olark. Build landing pages for different types of audience. (My examples: Blogger & Developer). Provide extra incentives on the checkout page. Shorten your checkout process as much as possible. Show different messages/landing pages based on where the visitor is coming from. Use real statistics in prominent place, because that’s what convinces people the most. Compare you to your competitors side-by-side. Hide the coupon field at the checkout page. Provide a fully working demo/playground. Include what, when, where, how and why in the tour page. More images, videos, lists, tables, numbers. Less paragraphs. A/B test as much as possible so you know what works and what doesn’t. Not only track pageviews, track where revenue are coming from with Clicky. Spend more time increasing conversion rates than focusing on getting traffic. Learn where your customers are exiting your site with KissMetrics. Feature yourself in industry-related blogs/magazines. Write a fair comparison between your product and your competitor’s. Get in touch with the tools you utilize for your startup and do a guest post. Have a unique voice in your interviews and blog posts. Offer discount codes to as an appreciation to readers for reading your post. Add features only when your customers need it. It’s okay to remove features if it is no longer useful. Release updates often to show your product is active. Have couple “Made My Day” secret features to give your customer surprises. Provide extremely easy way for your customers to update. After all, position yourself as a farmer and take your startup to a long-term success!